The Lock Doctor is a Victoria locksmith that has served residential and commercial customers for more than 37 years. We are committed to connecting our clients with high quality and honest security solutions and locksmith services. The Lock Doctor offers a full line of security products and services for home and business. Please visit our shop to see our full selection or contact us to schedule service. In an effort to keep our customers informed about innovations in the industry, The Lock Doctor showcases products that are highly effective. 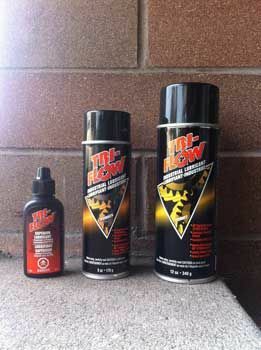 This month’s featured product is Tri-Flow™ lubricant. High quality Tri-Flow Superior Lubricant provides twice the lubricating power of most competitors’ brands and its light viscosity allows for deep penetration into hard-to-reach areas. It is ideal for loosening rusted and corroded nuts and bolts and can be used in any weather condition or temperature (-60° to 475°F). Tri-Flow Superior Lubricant’s formulated solvents soften and remove dirt and contaminants while its special additives displace moisture to prevent rust and corrosion. Contact us to today to learn how we can serve you as a trusted locksmith in Victoria.